Kwang-Young Chun will attend the opening of his exhibition, Aggregations, New Work, at 4 p.m. January 17 at the Daura Gallery. The exhibition will run through March 2. Chun began his series, Aggregations, in the 1990s. Today, he is recognized internationally for these sculptural and wall-relief forms. The fundamental elements of his work are individual, triangular, Styrofoam forms that Chun wraps in Korean mulberry paper twisted into string, and assembles into large-scale works. The whole is an aggregate of its many parts. Chun’s early artistic career was spent studying western painting, specifically Abstract Expressionism. Mulberry paper gives him a way to express his unique Korean artistic voice. This exhibition is curated by Susan Moldenhauer, director and chief curator of the University of Wyoming Art Museum, and is funded in part by the National Advisory Board of the UW Art Museum and the Wyoming Arts Council through the National Endowment for the Arts and the Wyoming State Legislature. Image: Close-up of Kwang-Young Chun’s work, mixed media and Korean mulberry paper. Reproduced by permission of the artist and the University of Wyoming Art Museum. Also opening on Jan. 16 is Daura in France. That exhibition will run through May 25. In 1914, at the age of eighteen, Pierre Daura left Barcelona to pursue his art career in Paris. Under the tutelage of André Lambert, a graphic artist and founder of Janus, a periodic literary journal, he sketched many portraits and city scenes that became the basis for engravings. He exhibited paintings at the Salon d’Automne in 1922 and 1926, but rejected by the Salon in 1928, he joined the artists Joaquim Torres-Garcia, Jean Hélion, Engel-Rozier, and Alfred Aberdam to hold a critically acclaimed exhibition, Cinq Peintres refuses par la Jury du Salon d’Automne, at the Galeries Marck. During the 1920s and 30s, he continued to exhibit regularly in Paris, Barcelona, and elsewhere in Europe, where his work was well received by critics. When Daura and his wife, Louise, visited the medieval mountain town of St. Cirq while on their honeymoon in 1930, they bought a twelfth-century house where they lived and worked on-and-off until late in their lives. This exhibition, drawn from the Daura Gallery and private collections, examines the urban and rural landscapes and people of France that provided Daura a constant source of subject matter. 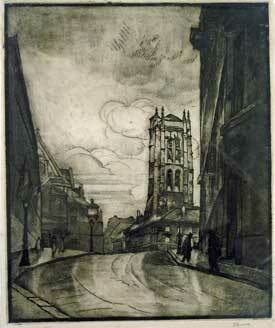 Image: Pierre Daura, Rue Cujas – Tour de Clovis Paris ve, 1924, engraving. Collection of the Daura Gallery.